James Gunn has released the first look at his newest pet project, The Belko Experiment, where a bunch of white-collars are trapped in an office building and forced to fight to the death. Sign me up- for the movie, not the death part. The Belko Experiment, or Battle Royale for taxpayers, is a collaboration between Gunn and Wolf Creek writer/director Greg McLean. It’s a bloody gorefest about a group of Americans who work for a non-profit in Colombia. One day, seemingly out of nowhere, metal doors come sliding down all the building’s exits and windows, and they’re told over the PA that they have to kill their co-workers in order to survive. It becomes a Lord of the Flies situation as some try to band together, while others embrace the chaos. The film debuted at the Toronto Film Festival last September but isn’t scheduled for release until next year. Gunn released the teaser on Facebook Saturday, also announcing the debut of the first full-length trailer on November 30. 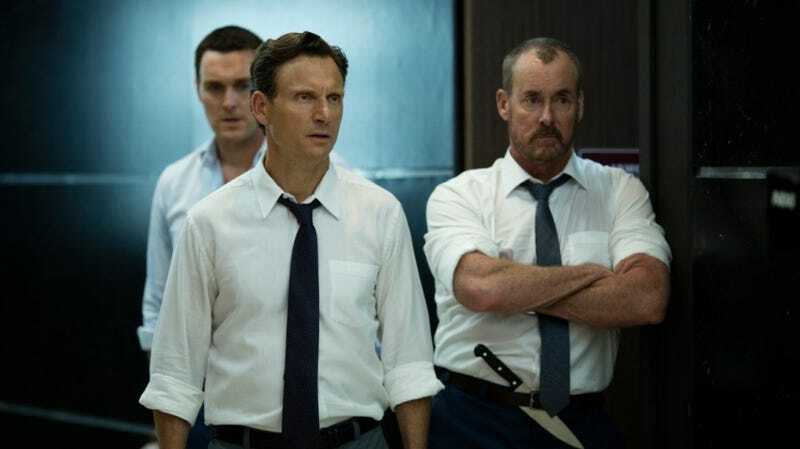 The Belko Experiment arrives in theaters March 17, 2017.